The wait is over. Get out your paints and brushes. Dark Sword Miniatures has just released their first set of premium pewter miniatures based A Song of Ice and Fire. Here’s a look at nine of the ten figures in “Wave 1,” as painted by the award-winning brush of Matt Verzani. (The tenth, Melisandre, can be seen here, as painted by Alison Scheirman). 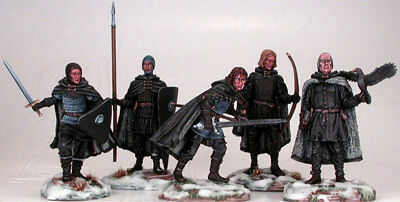 four Sworn Brothers of the Night’s Watch, including: raven keeper, archer, spearman, axeman/ swordsman. Participants will receive one chance in the drawing for each set they purchase. So head on over to Dark Sword and place your order now, or you find that you’re number 102 and out of the running for all the cool prizes. And while you guys are painting up these figures, Tom and Jim and I will be looking forward to the next set, and discussing which characters should be included. If you like to put in your own two cents, sound off on Dark Sword’s message board and let them know which Ice & Fire character you’d most like to see in pewter. We have lots of exciting plans for this range of miniatures, including more special promotions and raffles, painting contests, limited edition collector’s figures, and the like, so check the Dark Sword website early and often for updates and announcements.